JAE IS A VERY EXPERIENCED COVERS ARTIST & HAS A PROVEN TRACK RECORD FOR KNOWING HOW TO READ A CROWD & ENTERTAIN IN THE MANNER NEEDED FOR YOUR BAR OR EVENT/BIRTHDAY ETC..... JAE IS AN APPROPRIATE ACT FOR DINNER MUSIC, LIVELY BARS OR PARTIES. A SOLO ARTIST THAT CAN WORK AN AUDIENCE INTO A FRENZY OR CHILL IN THE BACKGROUND. WITH JUST THE RIGHT MIX BETWEEN SOLO ACOUSTIC & BACKING TRACK PERFORMANCES. 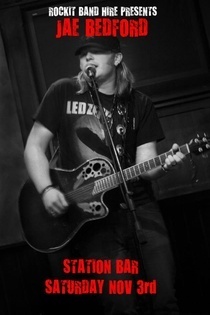 JAE HAS HAD OVER 10 YEARS EXPERIENCE ENTERTAING A HUGE VARIETY OF AUDIENCES. PROUD MARY, OLD TIME ROCK N ROLL, WHY DOES LOVE DO THIS TO ME, SWEET HOME ALABAMA, TALKIN BOUT A REVOLUTION, LIVIN ON A PRAYER, HAVE YOU EVER SEEN THE RAIN, MUSTANG SALLY, CRAZY LITTLE THING CALLED LOVE, BORN IN THE USA, WAGON WHEEL, Little lion man, The gambler. American pie. I fought the law. Sweet child o' mine. Its my life. Brown eyed girl, Born to be wild, Kryptonite, Copperhead road, Summer of 69, Country Roads, Save tonite, Breakfast at Tiffanys, All summer long, Wonderwall, Runaway Train, Delta Dawn, Blister in the sun, Living next door to Alice, 500 miles, Wake me up, little talks, Radioactive, Wish you were here, Footloose, White wedding, 50's Rock n Roll songs, CCR and more. Jae Bedford is an affordable alternative to a highly priced band with 15 years performing. A top quality entertainer. He has been entertaining audiences professionally since 1996 with material that covers the 50's to today. Country-classic rock. Jae Bedford is a solid investment. JBE is The NZ leader and is on the cutting edge of entertainment, music education, Events and band hire. Jae Bedford Entertainment has been running since 1996. JBE specializes in Music education, band hire, management & Events. Jae has been an entertainer & promoter since 1996 and has released several solo and band albums. 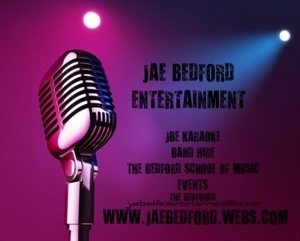 Jae runs the Bedford School of music & Rockit band hire. In his down-time Jae has written an educational book on music management & performance. Jae now manages many great musicians and bands and writes songs for many of these acts. JBE is The NZ leader and is on the cutting edge of entertainment, Events, music education and band hire. Est 1996.